The team behind the University of Northampton’s new campus has come to the rescue of the town’s Sea Cadets, after a series of companies refused to install a badly needed front door at their headquarters. 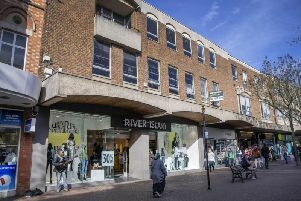 Northampton Sea Cadets’ Lieutenant, Chris Read, was becoming exasperated after receiving knock-backs from three door-fitting firms who were put off by the building’s location – on an island in the middle of the River Nene. Given the building’s close proximity to the University’s new Waterside Campus – which is in the final stages of construction on the other side of the river bank – Lt Read contacted the institution in the hope of finding a solution. “Problems with getting to the site means we have difficulties having large materials delivered. Or if a company says it can deliver, the price rises significantly so it’s out of our reach – we are a charity and rely on local support for funds. The university put the cadets in touch with construction company Bowmer & Kirkland, which is building the campus, and supplied and fitted the door free of charge. Nick McQuaid, Bowmer & Kirkland contracts manager, said: “When we heard about the trouble the cadets were having trying to get a new door delivered and fitted, we were only too happy to help. Lt Read added: “We are very grateful to Bowmer & Kirkland and the University for their help. The door improves the look of the building, making it a more secure and welcoming environment. Northampton Sea Cadets has been based on Calvesholme Islands, at the rear of Beckets Park, since 1951. Established in 1942, the registered charity aims to help young people progress to responsible adulthood using watersports and the theme of the Royal Navy. The unit comprises 130 members aged between 10 and 18, supported by 28 unpaid adult volunteers.